Over the past decade, there has been a great deal of attention and interest directed towards Mars. Not only have robotic explorers revealed a great deal about the history of the planet; by 2030, NASA hopes to mount a manned mission to Mars so astronauts can finally explore the surface in person. As such, it is understandable that there has also been renewed interest in colonizing the Red Planet. These plans range from establishing a small, crowdfunded settlement to Elon Musk’s plan to build a colony with 80,000 people. But by far, the most ambitious plan calls for the transformation of Mars’ environment to suit our needs. Otherwise known as terraforming, the idea has attracted its share of enthusiasts and skeptics alike. But at a recent biotech conference hosted by the Defense Advanced Research Projects Agency (aka. DARPA), Agency spokespeople announced that they are taking steps to make this a reality. For some time, DARPA has been involved in genetically engineering bacteria for the sake of performing specific tasks. But for the past year, the Agency has also been looking into the genetic manipulation of any and all micro-organisms that could help transform hostile environments (like that found on Mars) into something liveable again. As it stands, only two organisms are used in synthetic biology projects – E.coli and yeast. Jackson hopes to expand on that, using modern genetic techniques and cellular biology to develop bacteria that can alter environments to suit our needs. Towards this end, DARPA and some of its research partners have created software called DTA GView, a Java package used to display and navigate bacterial genomes and generate high-quality genome maps. In addition to this software package, a web server, GView Server, has been developed for comparative genome analysis tasks. By cataloging the genomic data of all known organisms, the software can help biological engineers to select the best genes from different forms of life and edit them to create something new. And by enabling rapid sharing of this data with other research labs through the web server, Jackson believes that engineers will be able to sequence and find what they need within just a day’s time. The first step for the BTO is likely to be engineering bacteria and other microorganisms for the sake of carrying out simple tasks. But the long-term aim, as Jackson indicated, will be to do this with more complex, multicellular organisms that could be used in the event of man-made or natural disasters, or to correct environmental damage. This is where terraforming comes into play. As human beings gain experience designing extreme organisms to deal with oil spills, nuclear accidents, climate change, and other disasters that can turn habitable areas into wastelands, that experience can then be leveraged into turning planetary landscapes that are cold, dry, and not suitable for terrestrial life (i.e. Mars) into something Earth-like. For some time, scientists have understood that in order to terraform Mars, a number of things would need to be accomplished. First, the carbon-dioxide rich atmosphere would need to be transformed into one that is rich in nitrogen and oxygen. Photosynthetic organisms – like cyanobacteria – are already capable of doing this. But with the appropriate adjustments, they could be tailor-made to do it more rapidly and under different conditions. Over time, these efforts could allow Mars’ atmosphere to thicken, causing it to retain more heat and filter out a great deal of the radiation that its surface is regularly exposed to. After that, various new species of genetically-modified plants could be introduced that would help convert the atmosphere further and enrich the soil to something we can grow food in. And with a breathable atmosphere restored, Mars’ ice could sublimate, and warm, flowing water could once again flow across the surface. 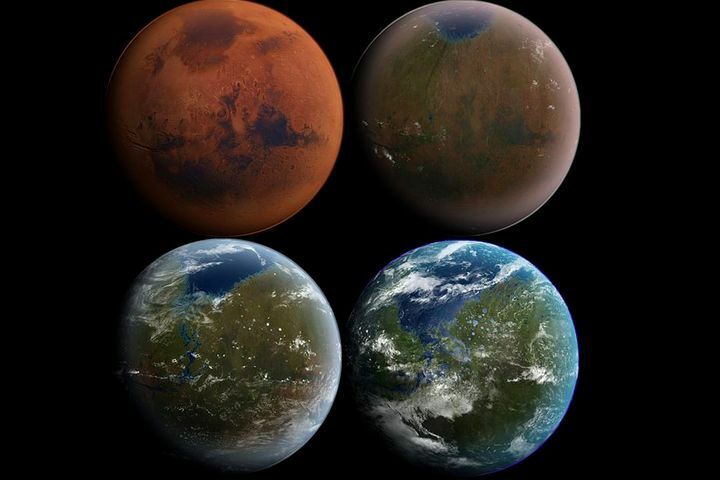 The Red Planet would slowly turn green, and then blue, and a backup base for humanity could finally be established! Do you have an idea on how space exploration could be improved? Then go to the Launch your Challenge page and be prepared to make a difference! Could ‘leaked UFO photos taken from US submarine in 1971’ prove existence of aliens?